A new series of heavy duty vehicle mounted duplexers has debuted from the Sinclair Technologies division of Norsat International Inc. ("Norsat") (TSX: NII and NYSE MKT: NSAT)—Sinclair is based in Aurora, Ontario, Canada. This highly ruggedized product line is ideal for use by law enforcement agencies to ensure the integrity of their communications in rough, off-road and extreme environmental conditions. 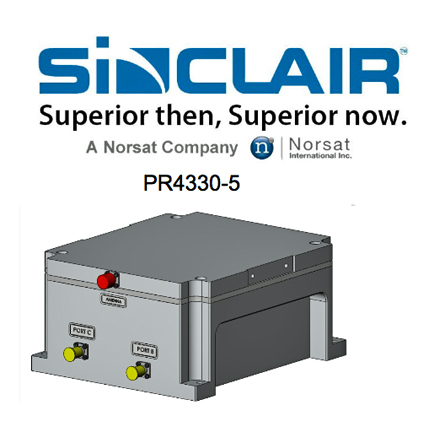 The PR4330 is a narrow band 700/800 MHz duplexer that offers ultra-rugged construction, excellent protection from out-of-band frequencies to minimize RF interference and to maintain good signal quality, and excellent temperature compensation to keep stable product performance over a very wide range of temperatures. The ruggedized features of this product are extremely important as high reliability of communications during critical situations is vital to the success of tactical operations. Additionally Sinclair Technologies have expanded their portfolio of covert antennas designed to support law enforcement activities. The new offering expands the frequency range and antenna designs to offer more options for law enforcement agencies to choose from. This is another example of Sinclair's ability to customize solutions to meet customer's unique requirements.